It was 7:30 in the morning, and I had finished checking out of my hotel in Bikaner, a city in the northwest state of Rajasthan, India. After being on the road for two weeks, my internal battery was down to one bar. 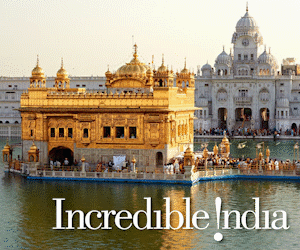 I was in India, overwhelmed by the colourful sights and sounds, and I wanted to see it all. And to me, a trip to India wouldn’t be complete without a visit to Karni Mata, a sacred temple in the small desert town of Deshnoke. Why—because I wanted to see the place where rats, typically the most hated of animals, are revered. 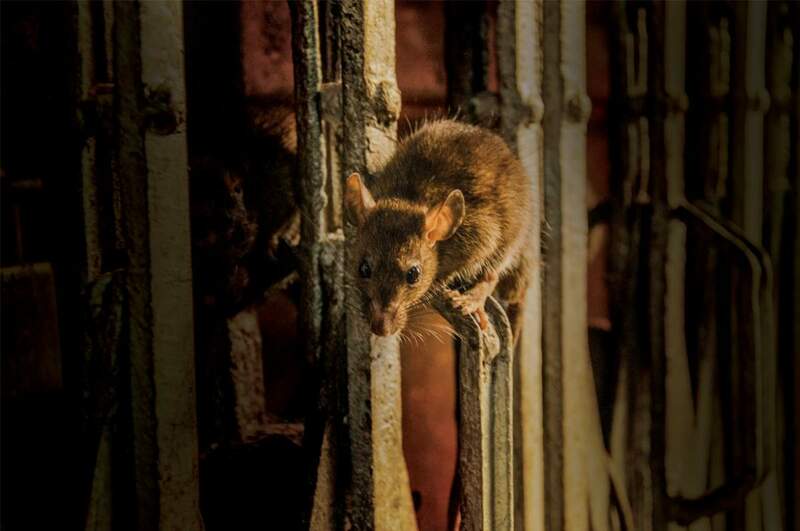 The holy place where more than 20,000 rats—big fat rats!—call home. Loading my luggage into my driver Manu’s car, my excitement surpassed the overbearing exhaustion I’d been feeling the past few days. I was energized and ready to embark on my next adventure. I envisioned the temple walls, engraved with marble carvings, while black and white checkered tiles paved the temple floor. Since I had only experienced the essence of the temple through television and photographs, the anticipation was rising as I got closer. I had dreamed of visiting the temple since I was seven years old, after watching a documentary about Karni Mata on TV. Quite an odd dream, for a seven-year-old girl—most people would cringe at the thought of stepping inside a place inhabited by 20,000 of the world’s ugliest rodents. Sitting in the back seat of the car during our approximate 20-minute ride from Bikaner, all I could visualize was a place covered in feces, with the smell of dead carcasses filling the air. What was I getting myself into? My heart raced and butterflies flooded my stomach when I learned no shoes were allowed in the temple to protect the rats from being stepped on. Was I prepared to walk barefoot on a floor covered in feces, let alone be possibly swarmed by thousands of rats? Luckily, I was later informed I was allowed to wear socks, which eased my anxiety—greatly! Approaching the sandy parking lot, I reflected back on when I had learned about the temple, and why it stuck in my mind all these years. What fascinated me was the bond and interaction between the rats and the humans who look after them in the temple—and yes, they are specifically attended to by people! The rats, in fact, are worshiped, and visitors often bring food inside to pay their respects. 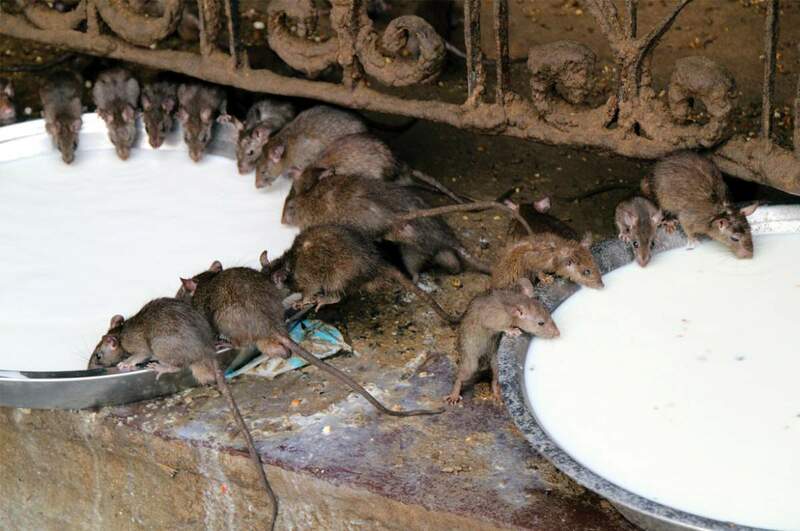 In most places in the world, it’s considered unsanitary to share food and drinks with rats—at this temple, it’s an honour. The Charan caste of Rajasthan faithfully worship the rats of Karni Mata. They believe the rats are reincarnations of ancestors of the goddess Karni Mata, who is thought to have helped found Deshnoke and is believed to have divine powers, being the incarnation of the mother goddess, Durga. According to legend, Karni Mata’s son Laxman drowned in a pond, whereupon Karni pleaded to Yama, the god of death, to bring him back to life. Yama refused her request, saying Laxman had already been reborn as a rat, and telling Karni that from then on all her male descendants would be reincarnated as rats before they were reborn as humans. The locals of Deshnoke believe that the rats are reincarnations of their ancestors, including their own children who died during infancy, and as rats, are taking a short break between human incarnations. The rats, in fact, are known as Kabas Marwari, which translates to little children. If a visitor was to accidentally kill one, he or she is responsible for its death and must replace the rat with one made of solid gold. I stepped out of the car, and walked towards the booth to check in my shoes before entering the courtyard. As I took each shoe off I slipped on a pair of black socks, and placed the shoes on the counter as two men near the entrance handed me a ticket to claim them after my visit. “Please madam, 20 rupees to bring camera in temple,” an older man working at the temple suddenly shouted to me, after noticing me handing my bag to security. I reached in my right pocket, handed him the rupees in exchange for a receipt written in Sanskrit with the number 20 scribbled on it. Massive silver doors with geometric designs gave off a kind of indomitable glow at the entrance, which was surrounded by marble carved with intricate patterns and images of elephants, rats and roses. Everything was beginning to seem rather official or overly mannered for the occasion, and I couldn’t believe the process I was undergoing to see rats. My senses began to heighten as I took the first few steps inside the temple. To my surprise the air smelled fresh, not what I had expected from a place crawling with thousands of rodents. I was on guard for fear that a rat would fall on me from an above ledge, which is known to happen from time to time. Suddenly I spotted my first rat. It was a young one, lying dead as flies circulated its body. I had an unsettled feeling in my stomach. A larger rat, about the size of a pear, dashed right in front of me. I looked up and took a glance inside the room. At first glimpse, I saw only a few dozen rats. I thought to myself, were people exaggerating when they talk about the amount of rats living here? I was starting to feel skeptical. But the more I examined the room, I more I noticed furry little bodies buried in the small holes of the walls and resting along each loop of the gates. Peering over to the left side of the room, I noticed four rats lapping up milk from a large silver tray. I approached them slowly, hoping not to scare them away. Each rat was perched up on the rim of the tray, neatly in a row. 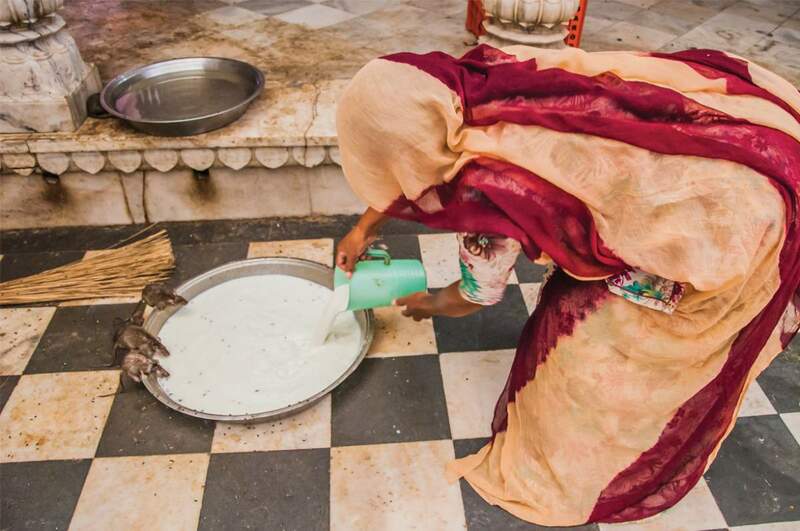 A woman carrying a jug of milk turned to me and smiled, before pouring it into the tray. The rats were fearless as the woman came close, continuing to drink without scattering away. A few steps away, a group of rats had swarmed around another dish, drinking water. As I kneeled down closer to them, I could see the beads of water rolling down their chins as they drank. I stood back up and heard a faint sound of crunching with every movement I made. I dreadfully decided to check what lay beneath the bottom of my black cotton socks—every step felt like I was walking on eggshells. I turned my foot around, exposing the sole of my sock, to find out what I’d been stepping on, and saw they were changing from black to charcoal grey, and speckled with yellow crumbs, grains and the odd piece of rat feces. The floor had a suspiciously sticky texture to it, probably from the sweets and sugar offered to the rats. The stickiness on my socks acted like glue, attracting every particle on the tiled marble floor. Wandering through the temple, and on toward the o utdoor courtyard, I observed adventurous tourists holding and stroking a few of the friendly beasts. The patchy fur and open wounds of the rats didn’t stop them from interacting with or even touching them. It was astonishing to witness such trust between rats and humans—let’s just say it’s not something my culture nurtures—with the rats knowing they weren’t threatened. Yet while I found them to be somewhat cute, I could not build up the courage to touch one. Even though it’s said no one has ever contracted a disease through the Karni Mata temple rats, I kept thinking I’d probably be the unlucky person who did. Stopping in my tracks, while deciding on which room to head toward next, a small rat approached my left foot. I stood still as the rat examined my toes, trying not to scare it, afraid I’d get bitten. It sniffed around, touched my baby toe, and carried on its way. It was as if I had received a quick blessing before continuing on with my exploration. At Karni Mata, I learned it’s a holy and lucky gesture to have a rat walk over your feet. Only the luckiest visitors, however, spot the few white rats in the temple, which are believed to be the reincarnations of Karni Mata and her four sons. Spotting one brings the promise of lifelong good fortune. Though I wasn’t lucky enough to have seen one, I did feel fortunate enough to have been given the chance to uncover the mystery of Karni Mata. I watched as visitors fed the rats offerings of coconut, Indian sweets and bread, then looked over at a small group of rats devouring the food in a corner. One man in particular rubbed the floor tile where a one-eyed rat he’d been feeding had been resting. It’s believed here that it’s an honour to walk on the same grounds as the rats, to eat food that has been nibbled on by them. Tempted as I was to try to participate in the custom, I decided to pass on the opportunity. As I said farewell to the temple, I reflected on how this experience had altered my view on the significance and place of these creatures in different societies. I was inspired by the powerful energy in the temple and to see hundreds of dedicated believers, as well as curious visitors like myself, gathered in such a fascinating space. 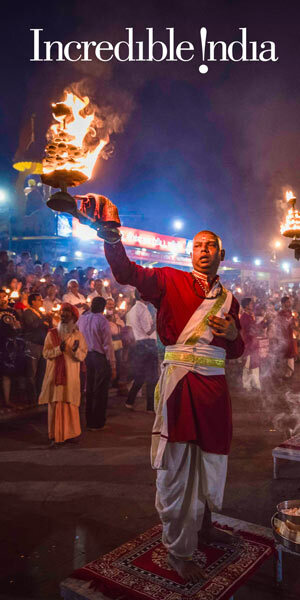 The bizarre rituals of the temple were unlike any experience I had encountered in my life. Just as I was wrapping up my visit and on my way to collect my shoes, I heard the sounds of a bell. The noises lead me back to the main room where I had begun my visit. I followed the sound into a dark room that people were exiting, and noticed they were coming from a connecting room, where there seemed to be a small shrine for Karni Mata. Each person rang a bell as they exited the crowded room. I lingered in the dark space for a minute, and just as I was about to exit noticed a man entering with an infant in his arms. The baby was no more than six months old, with an ailment on its upper lip. The father held the baby with one arm, while using his other hand to pet the back of a rat that was resting on a ledge. As he stroked the rat’s coat, he was reciting something under his breath, and I felt as if the man and rat were experiencing a sacred connection. I knew he was asking for a blessing from Karni Mata. After he finished, he took the same hand and wiped it over the baby’s mouth and upper lip. Though I will never know, I may have just witnessed a miracle. This was Gessi Kanellopoulos’s first feature for Outpost magazine.